For travellers on their summer holidays, where to stop for a toilet break can be a source of worry. Public toilet provision has been declining for a number of years and the BBC has learnt that some UK high streets and tourist hot spots now no longer have any council-run public toilets. At least 673 public toilets across the UK have stopped being maintained by major councils (unitary, borough, district and city) since 2010, according to figures obtained under the Freedom of Information law. In that time, the UK’s population has been increasing. * Where no data for 2010 was available, data for subsequent years up to 2013 has been used instead. Source: BBC FOI requests. Local authorities are not legally required to provide toilets, meaning they are often closed as councils look to cut costs. 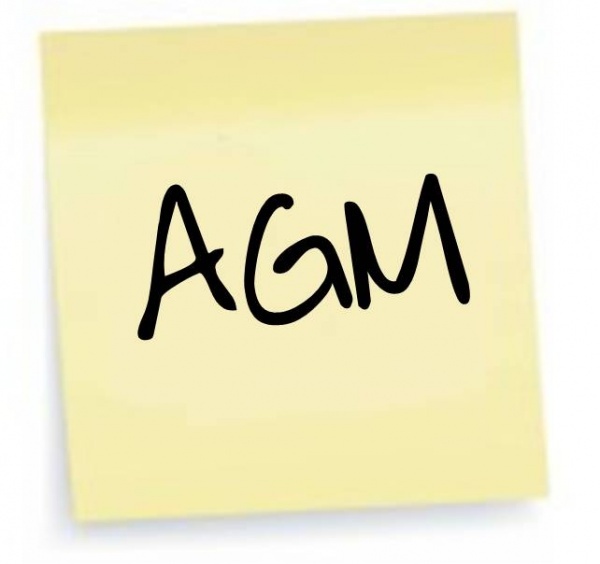 A Local Government Association representative said that, while councils were doing everything they could to keep public toilets open, substantial reductions to their budgets have meant they have had to make “tough choices” about public facilities. The Department of Housing, Communities and Local Government says it encourages councils to keep toilets open to the public since they are a “valuable community amenity”. These findings do not mean there are no toilets available at all, however – in many cases larger councils are shifting responsibility to smaller parish or town councils. Others have been handed to community groups and paid for through fundraising while some councils are relying on the goodwill of businesses to make their toilets available to the public. 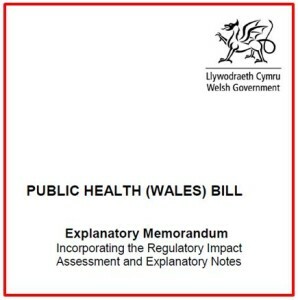 Andy McGuinness, campaign manager of Crohn’s and Colitis UK, claims handing the running of facilities over to parish councils in England is only a short-term fix, because it simply passes on the financial pressure. “It takes the upkeep off their books but it’s not sustainable. Parish councils will run them for a couple of years and eventually they’ll probably close anyway,” he said. 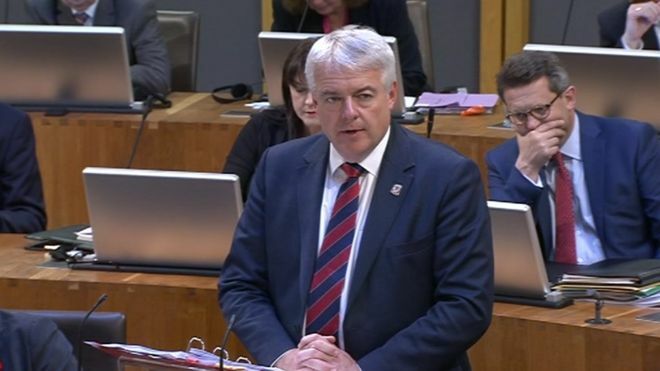 He added that, without action from government and local authorities, the increasing closures of public toilets in England posed a “very real problem for the millions of people living with continence problems”. Local councils (such as town and parish councils) get their money from a share of council tax. Sue Baxter, who chairs the National Association of Local Councils, said smaller councils were increasingly taking over discretionary services such as toilets as budget pressures meant larger councils were finding them harder to provide. 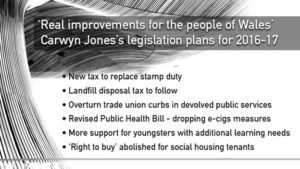 But, she said, they faced a dilemma – whether to allow toilets in their local area to close or take them on and face a hefty “toilet tax” in the form of business rates paid on the premises. 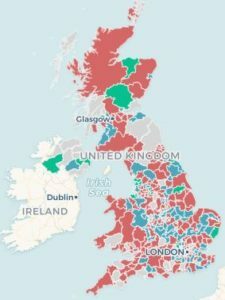 We asked the 50 councils with the biggest cuts how many had actually closed and how many had been handed over to smaller councils or other groups. Almost all of the 30 that responded had closed at least some, if not all, entirely. Only one council – East Northamptonshire – said its figures didn’t translate to any toilets actually being closed. Several had also handed the running of some toilets to private companies or community groups. Raymond Martin, of the British Toilet Association, said providing toilets was a public health issue, but it was also about equality and social inclusion. 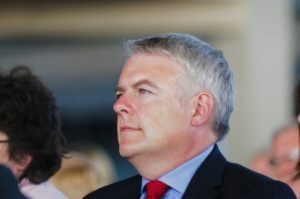 He believes that, while councils have no legal requirement to provide access to public toilets, they do have a “moral responsibility”. And charity Disability Rights UK says it has increasingly been receiving calls from disabled people reporting that accessible toilets are no longer available. With these significant reductions in facilities, you might reasonably assume some people will resort to using their wider environment when caught short. So the BBC also asked councils and police forces whether they enforced any laws against public urination, and what had happened to numbers of offences in the same time period. We found that around the country, very few local councils or police forces take action against public urination. Those that do, however, use a range of tools including by-laws, public order offences specifically tackling public urination, and broader offences including indecent exposure, outraging the public decency, littering and harassment. The London borough of Tower Hamlets, which had one of the biggest falls in the number of offences, said it has focused on “better enforcement” of the rules, which it said has acted as a deterrent. The council added that closures of pubs, clubs and bars had also contributed to the fall in offences. Cornwall’s unitary council saw the number of public toilets it maintains drop over the past five years, from 253 in 2013 to only 14. Over the same time, overall expenditure on toilets was all but wiped out, falling from £4.3m to only £217,000. A council representative said: “We recognise that public toilets are important to residents and visitors alike – but with huge cuts in funding by central government we have been forced, like other local authorities, to review the non-statutory services we provide. “We have now successfully transferred the ownership or management of over 200 public toilets to local city, town and parish councils and local community organisations and businesses. “Only 16 toilets have closed to date.” The council has also started charging for the remaining toilets it runs. Wiltshire Council now runs only one public toilet on its streets, and another five at park-and-ride sites, in comparison with 32 in 2010. One of the biggest spenders is the City of London Council. It spent £992,000 on running four public toilets in 2017. In 2010, it spent £1,029,000 on double the number of conveniences. When contacted by BBC News, the council did not comment on why expenditure had remained relatively flat. New Forest District Council followed, with an overall expenditure of £877,660 on 24 public toilets and refurbishment work in 2017. Bridgend County Borough Council in Wales now maintains only six public toilets, down from 16 in 2010. It said that three more toilets were likely to close in the next year, unless they are taken on by town councils, because of budget reductions. Meanwhile in North Ayrshire, there has been a fall from 45 in 2010 to nine in 2018. The council says five of these were transferred into community ownership and paid for through fundraising, while the rest closed outright. 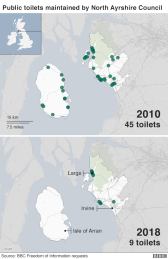 In Northern Ireland, eight local councils either increased or maintained the same number of public toilets between 2010 and 2018. Fermanagh and Omagh District Council had the highest number of council-run conveniences at 51 in 2018. Illustrations by Katie Horwich. Maps by Ed Lowther and Prina Shah. 60 % of British adults back the Government providing financial support for churches, chapels and meeting houses in order to protect their heritage and history for future generations, according to the findings of a new opinion poll, commissioned by the National Churches Trust. The overwhelming majority of British adults (84%) think that the UK’s churches, chapels and meeting houses are an important part of the UK’s heritage and history, according to the findings of the ComRes poll, which interviewed 2,038 GB adults online between the 16th and 17th December 2015. The poll found that 57% of British adults said that they had visited a church in the past year for religious services, non-religious activities or as a visitor or tourist. More than four in five Britons (84%) agree that the UK’s churches, chapels and meeting houses are an important part of the UK’s heritage and history. as directions, opening hours and details of things to see and do. Churches, chapels and meeting houses can continue to play a vital role in the life and well-being of the nation! According to the noticeboard displayed outside of the building, the spacious beige-tiled restroom has 11 different sections, including male toilets, female toilets, unisex toilets, accessible toilets, baby-changing facilities, an e-commerce area and an ATM room. The entire area has available Wi-Fi and there are vending machines selling different type of soft drinks. Each toilet or urinal is equipped with a flat-screen TV set nearby for entertaining the user. 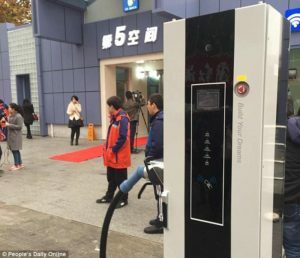 In Fangshan, a new public facility named ‘The Fifth Space,’ has turbo-flushing powers in the toilets, along with wireless internet and TV screens in the stalls. The windows are lined with aloe vera plants, and a cello soundtrack plays in the background. The efforts to clean up the public restroom are received well by many, but some residents argue that the technological additions are a waste of money that could be put to better use elsewhere. Others argue that these new gadgets in the restrooms will lead people to spend unnecessary time on the toilet and force others to wait. 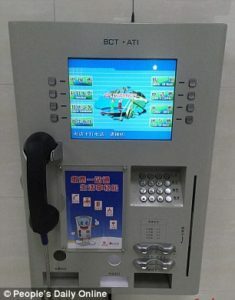 Toilet users can also buy drinks from the vending machines (left) and pay their utility bills using a multi-purpose phone. The efforts to clean up the public restroom are received well by many. And even all the functions above are not enough in Beijing’s ambition toilet revolution. 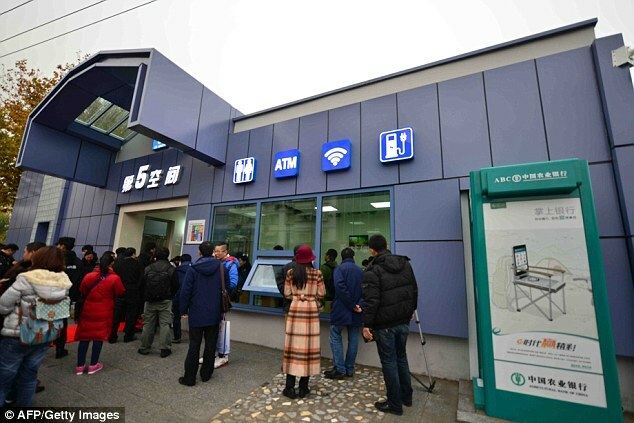 The spokesman said: ‘We will learn Japan’s experience to provide basic physical examination in the restrooms, such as blood pressure, heart rate and urinalysis.’ More of these ‘The Fifth Space’ toilets are due to open on the outskirts of Beijing soon – in Fangshan, Tongzhou, Shunyi and Pingu districts – as well as other Chinese cities, including Guiyang, Haikou, Kunming and Zhangjiakou. 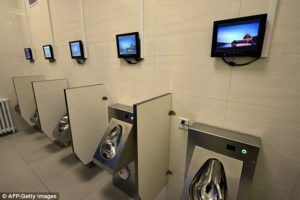 China will be renovating or constructing 57,000 public bathrooms, and some of them will be equipped with high-tech gadgets. Toilets in China, often squat toilets or concrete pits, have remained unchanged for generations. Between 1990 and 2010, China updated facilities for 593 million people, but the changes did not extend to everyone. For many years, China has suffered from sanitary issues in its public bathrooms. In poorer communities, 14 million people must defecate in the open. Many people are now arguing that unnecessary additions, like TVs, are a waste of money that could be used instead to update the facilities in poor areas. 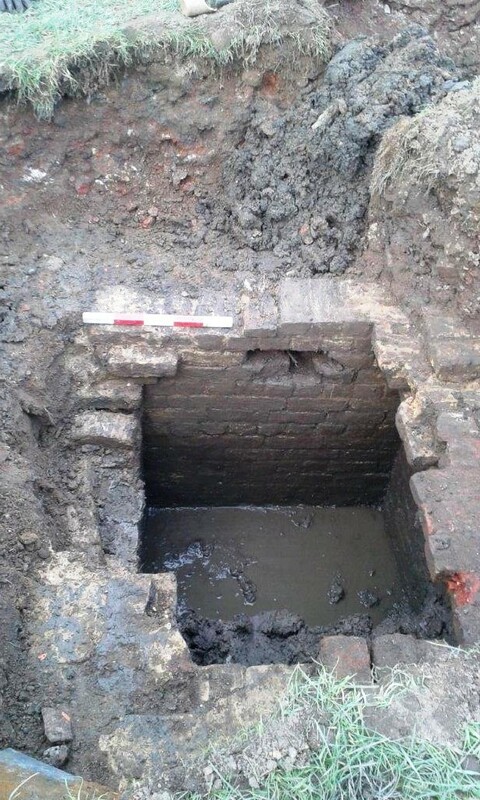 The remains of a 165-year-old toilet from the world famous exhibition which helped coin the phrase ‘spend a penny’ have been uncovered in London’s Hyde Park. The discovery was made by workmen creating a new pump house as part of a major water project on the site of the former Great Exhibition of 1851. What they initially thought was a pile of underground bricks is actually believed to be one of the few structures from the temporary exhibition to have ever been uncovered. 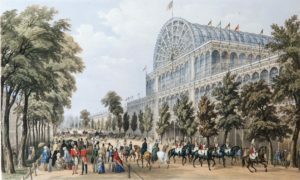 The news comes 165 years since the Great Exhibition – the world’s first trade fair – opened in 1851 (on May 1) in Joseph Paxton’s iconic Crystal Palace, which at the time was the largest building on Earth. It attracted six million visitors and was organised by a Royal Commission, whose President was Queen Victoria’s husband Prince Albert. One of the Great Exhibition’s landmark inventions was the introduction of the UK’s first paid-for flushing public toilet, when visitors spent one penny to experience a clean toilet seat, a towel, a comb and a shoe shine. Records show that 675,000 pennies were spent. When the exhibition finished, the Crystal Palace was moved to Sydenham, and the toilets were set to be closed down. However, Brighton plumber George Jennings, who invented the palace’s toilets, persuaded the organisers to keep them open. 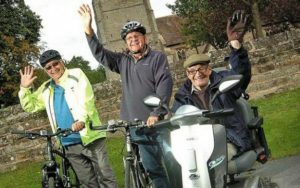 They later went on to raise a further £1,000 a year – the equivalent to almost 250,000 toilet trips. “What has been discovered in Hyde Park is believed to be the remains of an earth closet which were common place as toilets until the Great Exhibition of 1851. That landmark event introduced the water closet or WC, and what we now commonly call the toilet. “This is a fascinating discovery that once more brings to light the extraordinary innovations that the Great Exhibition inspired. It was the world’s first trade fair and the profits it generated – £186,000 – were used to establish the great cultural quarter in South Kensington, stretching from the Royal Albert Hall in the north down to the Natural History Museum and the V&A. The toilet was uncovered as The Royal Parks continue work on a project to create a new pump house near the Old Football Pitches and Tennis Centre on the southern edge of Hyde Park. The project will see new water distribution pipework installed to supply borehole water to the lakes, irrigation systems, public toilets and the Diana Memorial Fountain in Hyde Park and Kensington Gardens. Following a request from the Environment Agency, it will see the primary water supply for the Long Water in Kensington Gardens coming from a bore hole near the Old Football Pitches instead of from the Italian Gardens. Mr Strickland, who has been working closely with archaeologists on the project, said: “We have more than 20 lakes and ponds, and about 15 miles of river in the Royal Parks. We are proactive in our water management by reducing leaks and our reliance on treated mains water, abstracting water responsibly and looking to harvest rain and surface water. As work continues on the new pump house, The Royal Parks plans to re-cover the Great Exhibition toilet to ensure this historic structure remains in place for future generations.